These sensor designs incorporate spring loaded probes that insure that the probes are in intimate contact with the thermowell. This improves performance by providing a conductive path between the probe tip and thermowell, as well as improving vibration resistance. 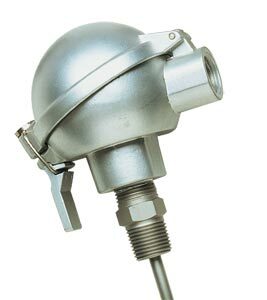 Supplied in the four most popular connection head styles, Cast Iron, Miniature Aluminum, Hinged Aluminum and Sub-Miniature Aluminum, with ceramic terminal boards or optional transmitters, these sensors can be configured to work with most thermowell type applications. These sensors are supplied with 100 ohm, Class A DIN Platinum elements contained in stainless steel probes and spring loaded hex fittings. 100 ohm Class A DIN platinum element, 3-wire configuration in a 1/4" diameter by 12" long spring loaded probe with cast iron connection head and ceramic terminal board. 100 ohm Class A DIN platinum element, 3-wire configuration in a 1/4" diameter by 9" long spring loaded probe with a miniature aluminum connection head and ceramic terminal board. 100 ohm Class A DIN platinum element, 3-wire configuration in a 1/4" diameter by 12" long spring loaded probe with an aluminum hinged top connection head and ceramic terminal board. 100 ohm Class A DIN platinum element, 3-wire configuration in a 1/4" diameter by 9" long spring loaded probe with a sub-miniature aluminum connection head and ceramic terminal board. Standard: Specify: 1/8, 3/16 or 1/4 for probe diameter in inches with standard lengths of 6, 9, 12, 18 and 24". For special lengths shorter than 24", specify length in model number and use next longer price. For probe lengths greater than 24", specify length in model number and add $1 per inch to the price. Metric: Specify: 6mm, 4.5mm or 3mm for probe diameter with standard lengths of 150, 225, 300, 450 and 600mm. For special lengths shorter than 600mm, specify length in model number and use next longer price. For probe lengths greater than 600mm, specify length in model number and add $1 per 25mm to the price. All: Specify protection head style: 12 = Cast Iron; 14 = Miniature Aluminum; 18 = Hinged Top Aluminum; 19 = Subminiature Aluminum.